POLITICAL TIDBITS: Email on new Pope from an old friend who studied liberation theology in Argentina and Ecuador. Another reader also emails: among priority items in agenda of world’s most famous Jesuit should be to discipline his many ‘pasaway’ colleagues in Order, especially home-grown ones. Email on new Pope from an old friend who studied liberation theology in Argentina and Ecuador. Another reader also emails: among priority items in agenda of world’s most famous Jesuit should be to discipline his many ‘pasaway’ colleagues in Order, especially home-grown ones. I just received an email from an old friend of mine, now living abroad, member of a large religious order, who in the 1980’s tried to study Liberation Theology. While doing his doctoral thesis in Theology from a famous Jesuit University in the U.S. East Coast, he made a short trip to Ecuador and Argentina to attend some seminars on this doctrine (now condemned in large part due to the non-compromising efforts of Blessed John Paul II during his 27-year pontificate) called “Liberation Theology” --- a “marriage” between the Gospel of Christ and Marxism. It’s an interesting footnote in history that Pope John Paul II not only helped in crushing Communism in his homeland of Poland and the rest of Eastern Europe; he also made sure Liberation Theology would not thrive in the Latin American countries where 51% of the Catholics of the world reside today. “Dear Bel: I got your email, which you sent me right after you posted your March 13, 2013 – Wed. blog. If you had waited five more hours, you could have included news of the election of the Argentinian Cardinal JORGE MARIO BERGOGLIO of Buenos Aires, who now answers to the name of Pope Francis I. “In the winter of 1987, I attended those nonsensical and ‘heretical’ seminars on “Liberation Theology” in Quito (Ecuador) and in Buenos Aires (Argentina) because my Jesuit thesis director required me to do so. “While in Buenos Aires, I never heard of Fr. Jorge Bergoglio. He was probably just a few years ahead of me in the priesthood, as he was ordained priest on December 13, 1969, his 33rd birthday. “I just discovered now in the Internet that he was appointed Rector of the Jesuit seminary in 1980. So, perhaps in 1987, he was teaching and running the seminary and in his spare time, helping out in some Jesuit-run lower middle-class parish of Buenos Aires. But I was not blessed with the serendipity of meeting him during my short stint in Argentina. “Pope Francis was an unexpected choice. At an online gambling site, his odds shortly before he was identified were 25-to-1, making him something of a long-shot. How unexpected was his selection? An American Catholic weekly crafted a biography of the Latin American prelate and suggested that he "at least merits a [second] look." “Until his election, Pope Francis had served as Cardinal-Archbishop of Buenos Aires since 1998 and was named a cardinal by Pope John Paul II in 2001. He should have retired one or two years ago, but for reasons known only to Benedict XVI, the now Pope-Emeritus never appointed a successor in Bergoglio’s Archdiocese of Buenos Aires. “Shortly after Pope Benedict announced that he was leaving his position on February 11, 2011 (Feast of Our Lady of Lourdes), journalist and pope-watcher Michael Dougherty crafted introductory profiles of each likely candidate. Dougherty suggested that a Bergoglio papacy would see social justice and humility rise as priorities in the Church. “That's echoed in his choice of name. (It's said that) St. Francis of Assisi, from whom his name is taken, was (told during a visit by Jesus Christ), "Francis, repair my Church which, as you can see, is falling into ruins." “Bergoglio, 76, reportedly got the second-most votes after Joseph Ratzinger in the 2005 papal election, and he has long specialized in the kind of pastoral work that some say is an essential skill for the next pope. In a lifetime of teaching and leading priests in Latin America, which has the largest share of the world’s Catholics, Bergoglio has shown a keen political sensibility as well as the kind of self-effacing humility that fellow cardinals value highly, says his official biographer, Sergio Rubin. “Every bishop and priest in Latin America is aware of the ever-growing number of defections to Protestant, Born-Again, and other Evangelical Sects from their very large Catholic flock. For this reason, ‘Bergoglio would likely encourage the church’s 400,000 priests to hit the streets to capture more souls,’ ” Rubin said in an Associated Press interview. “He is also most comfortable taking a low profile, and his personal style is the antithesis of Vatican splendor. ‘It’s a very curious thing: When bishops meet, he always wants to sit in the back row. This sense of humility is very well seen in Rome,’ ” Rubin said. 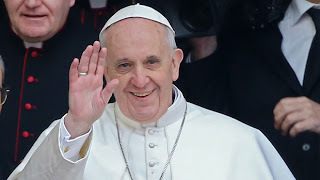 “Bergoglio rejected one notable trapping of his new position as Cardinal-Archbishop of Buenos Aires, choosing to take the public bus instead of a chauffeured car. “Born in Buenos Aires on December 13, 1936, Bergoglio's father was an Italian immigrant and railway worker from the region around Turin, Italy. He has four brothers and sisters. His original plan was to be a chemist, but in 1958 he instead entered the Society of Jesus and began studies for the priesthood. “He spent much of his early career teaching literature, psychology, and philosophy; and early on he was seen as a rising star. From 1973 to 1979 he served as the Jesuit Provincial Superior in Argentina, then in 1980 became the Rector of the seminary from which he had graduated. “These were the years of the military junta in Argentina, when many priests, including leading Jesuits, were gravitating towards the progressive ‘Liberation Theology’ movement. As the Jesuit Provincial, Bergoglio insisted on a more traditional reading of Ignatian spirituality, mandating that Jesuits continue to staff parishes and act as chaplains rather than moving into "base communities" and political activism. “Pope Francis is the first Jesuit to serve as pope. According to NBC News, he is also likely the first pope with only one lung, having had one removed as a teenager following an infection. “As you might expect, his views on broader subjects is fairly orthodox, earning, for example, a rebuke from Argentina's prime minister after suggesting that gay adoption discriminates against children. “After the dust settled from the election of Benedict XVI, various reports identified the Argentine Jesuit as the main challenger to then-Cardinal Joseph Ratzinger. One cardinal later said the conclave had been ‘something of a horse race’ between Ratzinger and Bergoglio, and an anonymous conclave diary splashed across the Italian media in September 2005 claimed that Bergoglio received 40 votes on the third ballot, just before Ratzinger crossed the two-thirds threshold and became Pope. “Though it's hard to say how seriously one should take the specifics, the general consensus is that Bergoglio was indeed the ‘runner-up’ last time around. He appealed to conservatives in the College of Cardinals as a man who had held the line against liberalizing currents among the Jesuits, and to moderates as a symbol of the church's commitment to the developing world. “Back in 2005, Bergoglio drew high marks as an accomplished intellectual, having studied theology in Germany. His leading role during the Argentine economic crisis burnished his reputation as a voice of conscience, and made him a potent symbol of the costs globalization can impose on the world's poor. “Bergoglio's reputation for personal simplicity also exercised an undeniable appeal – a Prince of the Church who chose to live in a simple apartment rather than the archbishop's palace, who gave up his chauffeured limousine in favor of taking the bus to work, and who cooked his own meals. “Another measure of Bergoglio's seriousness as a candidate was the negative campaigning that swirled around him eight years ago. “Three days before the 2005 conclave, a human rights lawyer in Argentina filed a complaint charging Bergoglio with complicity in the 1976 kidnapping of two liberal Jesuit priests under the country's military regime, a charge Bergoglio flatly denied. “All of that by way of saying, Bergoglio was definitely on the radar screen. Of course he's eight years older now, and at 76 is probably outside the age window many cardinals would see as ideal. Further, the fact he couldn't get over the hump last time may convince some cardinals there's no point going back to the well. My US-based 'correspondent,' Fr. Joseph, asserts that “although I cannot prove it,” he has a hunch that Pope Emeritus Benedict XVI had a hand in the election of Pope Fancis and that he was the candidate of the conservative Roman Curia, the papal court of Benedict. Pope Francis, he stressed, was right in asking help from the Poverello of Assisi. I wonder why our local media love to hype Bernas and Tabora. They are actually not great thinkers as what the media keep on apotheosizing. Well, what do you expect from our local media? Konting ingay lang at papansin, magaling na sa kanila.